It's funny how even though I am many summer's past my school days I still think of summer as vacation time and I never manage to get much of anything done. So when our annual family reunion came around last week I needed cookies that were easy-breezy and these summer flip flops were just the ticket! In planning this set of cookies I only hit one snag. This is the flip flop cutter I have along with a foot cutter. I'll admit that it drives me a little crazy that they don't match. 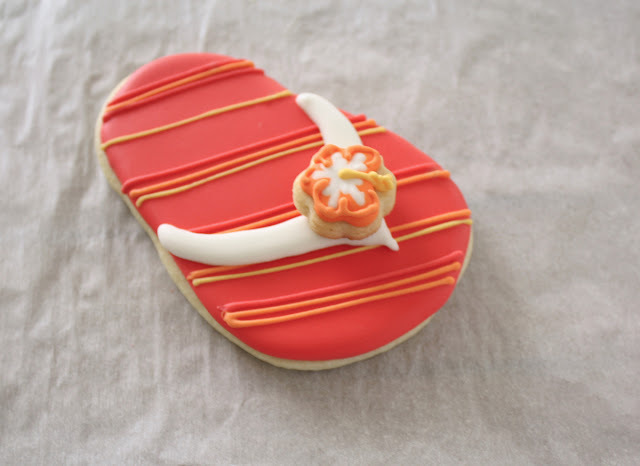 This foot just would not wear this shoe and while I am certianly not the expert on putting a cookie platter together I think the size and scale of cookies in a set should match if possible. So I decided I had to have a different flip flop and the only way to get one that would match the foot would be to make one. It is basically just an oval after all so how hard could that be? I followed LilaLoa's tutorial to make a cookie cutter except instead of using sheet metal from the hardware store I cut up a cheap cookie sheet from the dollar store. 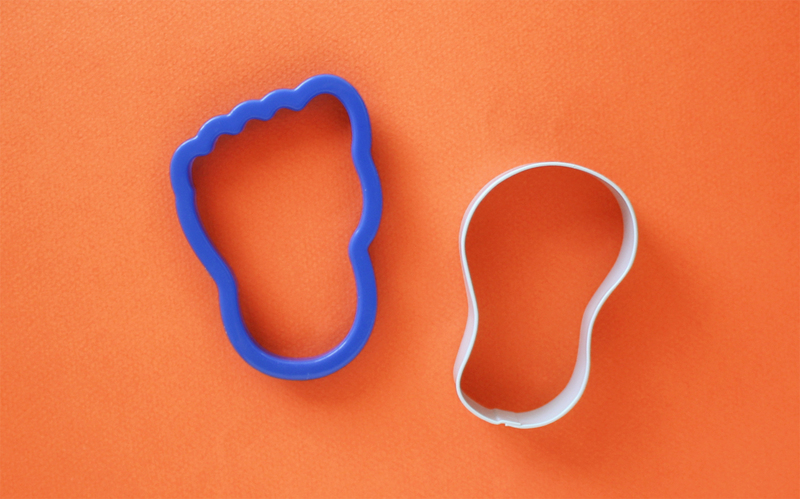 Then I used the foot cookie cutter as a form to wrap and bend the metal strip and now I have a flip flop just the right size for the foot! 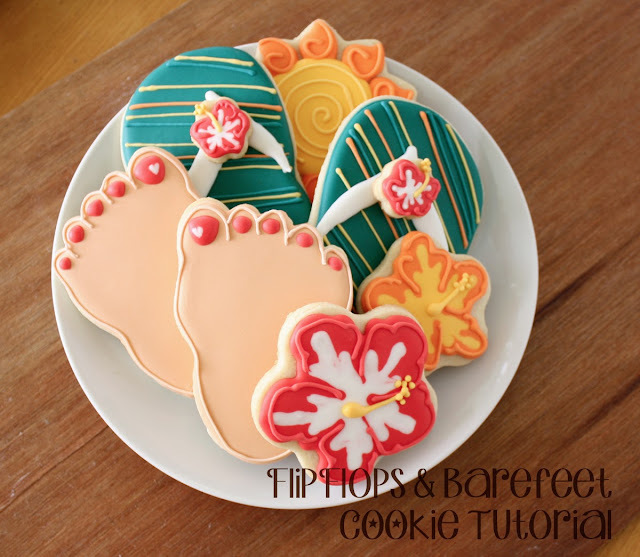 For the feet cookies outline and flood the cookie in flesh colored royal icing and let dry for several hours. When the icing has set up add painted toenails in a thicker flood icing and outline toes and you're done! The flip flops are pretty much done the same way as the feet. Outline and flood the flip flop in the color of your choice and let the icing dry for several hours. When the icing has set up add details like stripes or dots and after they've dried a little while finish off the cookie with a thong in thicker flood icing. You could also add the details right into the wet base if you like. 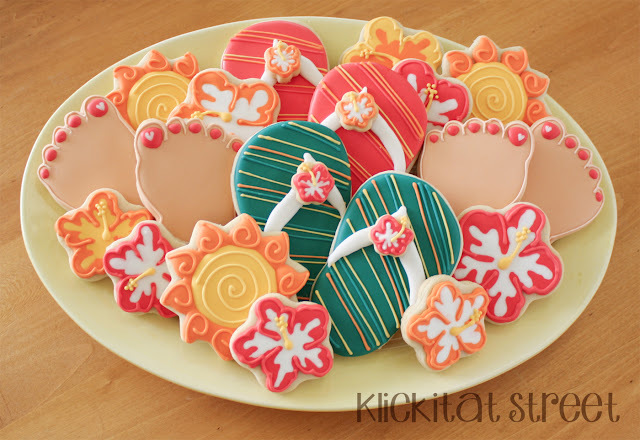 I added a teeny tiny flower cookie as a decoration to the flip flop but you could use fondant or royal icing transfers or they are cute just as they are! I hope you are all enjoying your summer! What have you been up to?